posted March 25, 2016 03:09 AM bonus applied by angelito on 29 Apr 2016. Edited by Biobob at 20:34, 11 Jan 2017. This thread shall be used to share everything that is needed to make a map. 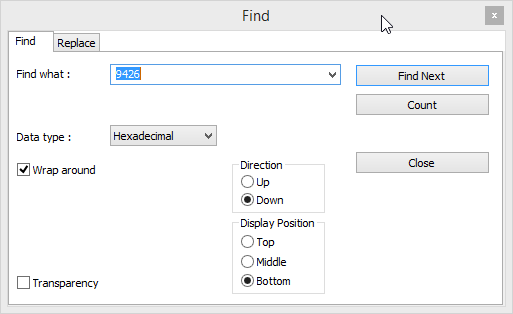 Looked for things in this thread are the ones you don't find easily without knowing what to search for (specific programs, hex editing guides, etc.)! This post will be regularly updated with all relevant information. 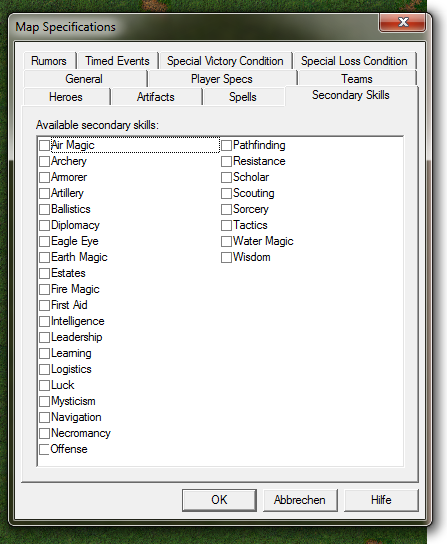 WoG Editor: The ultimate ingame editor! Note that I don't know the creators of some of those programs! If you happen to have information, please let me know! 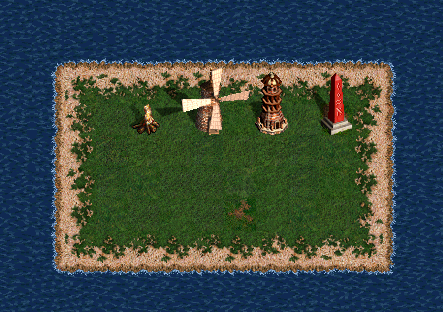 This thread shall be used to share everything that is needed to make a map. 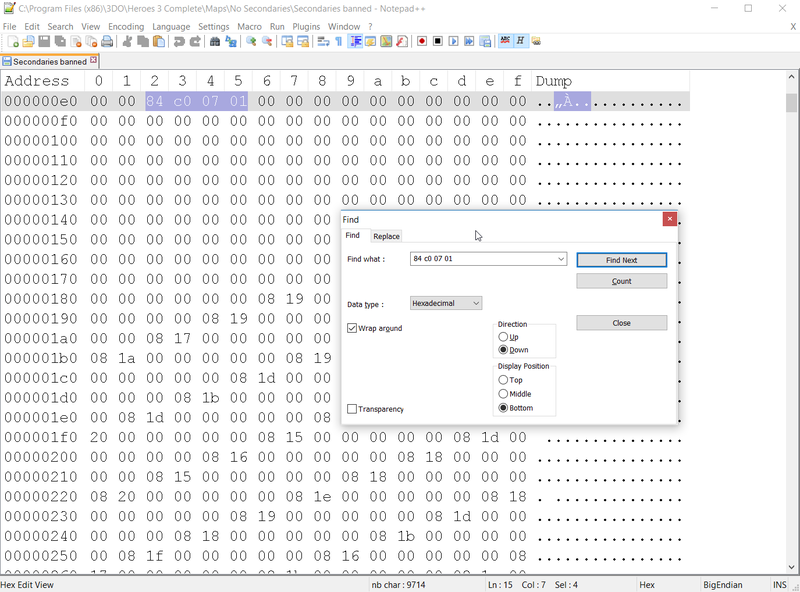 Looked for things in this thread are the ones you dont find that easily without really knowing what to search for (specific programs, hex editing guides, etc.)! We still lack a topic in which all of that kind of knowledge is gathered, so this is it. posted March 25, 2016 01:23 PM bonus applied by angelito on 29 Apr 2016. Edited by Uhm at 21:54, 25 Mar 2016.
but probably there is one or two more. Just press Ctrl+f and write down name of similar object, which is available in editor (check for name in WoG editor in object's advanced properties or look for it in MMarchive). Copy whole line, paste below and change it's name to a desired one. 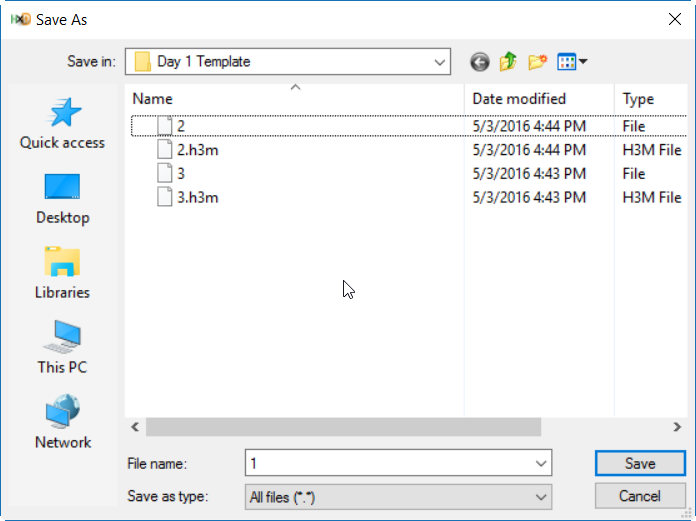 Save "Objects.txt" and put to the "data" folder. Notice, that you can change type and passability of every object and your map will "remember" this change, even when you will change values in "objects.txt" once again. Thus, the same objects on your map can have different content! When your map is saved, remove "Objects.txt" from "data", so game won't crash. Tadam! 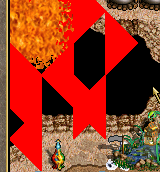 As you can see, sometimes objects (here original campfire) will have wrong animation and broken palette. That's when an old def file contains bitmaps with the same names as bitmaps inside our new def file. We can fix it by changing def's content, but it will work only for players which will receive a new def. Columns described as "special objects" and "terrain objects" are responsible for a place in editor, where we can find object. In "Terrain objects" game looks for a value "1" from right to left, so AVMwwhl0.def can be find in Dirt, Grass and Swamp section. "Type" means whether our object will work as well, mine, obelisk, etc. "a" is subtype, e.g. dwellings and artifacts use them. "c" can be "1" or "0". "1" means "a part of a ground". And as I mentioned: map will "remember" changes to a specific object placed on a map, so the same objects on your map can have different passability and effects! Edited by RoseKavalier at 14:59, 25 Mar 2016. You're in luck, our friends over at DF2 have prepared a WoGEditor with these files readily available at a click. Edited by Biobob at 00:43, 07 Jan 2017. For now: You can use everything from h3sprite.lod that has a .def as well as a .msk! 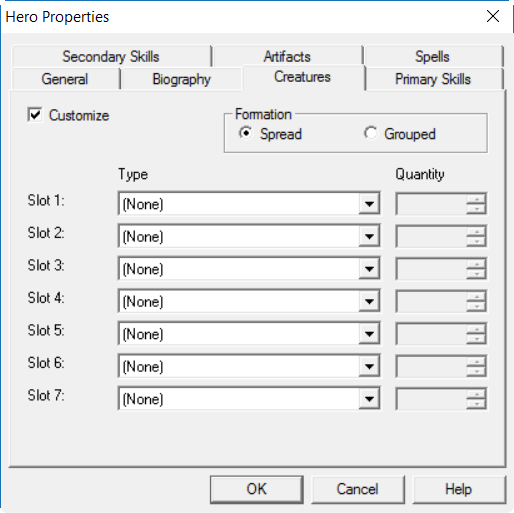 Let's create a hero without creatures. This hero will start as a ghost hero without any creatures in your map (=2000 Movement Points). 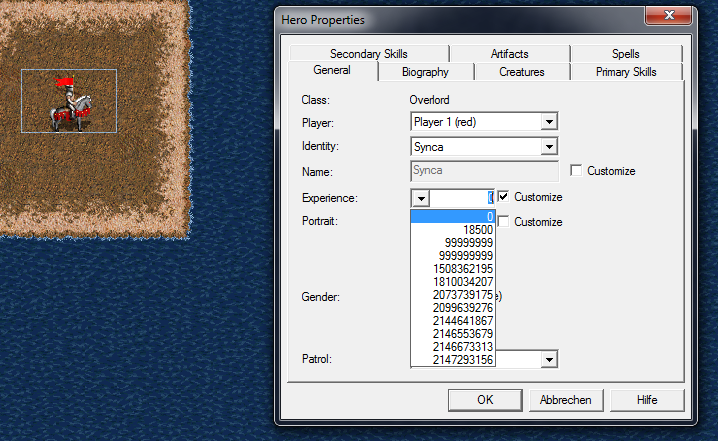 Unluckily, it does not allow you to put more than 9999 creatures in one stack when in the editor (or anything else the normal editor could not do for that matter, the ONLY change is the suggested experience values in hero screen). It still saves a lot of time when putting high level heroes on the map! I tested out all the experience values, there were some new ones I had not used yet! 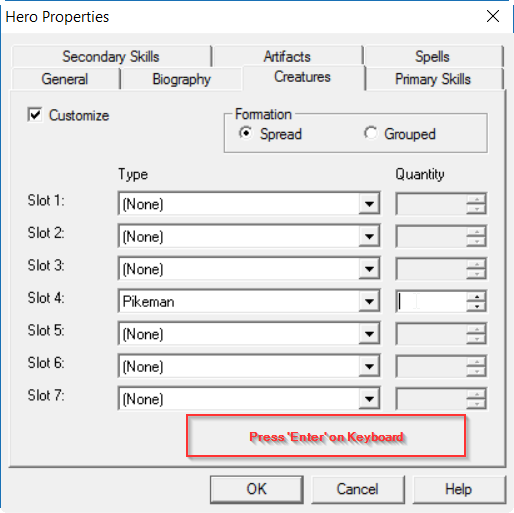 These can be used as flexible values when trying to assign a hero specific primary stats! 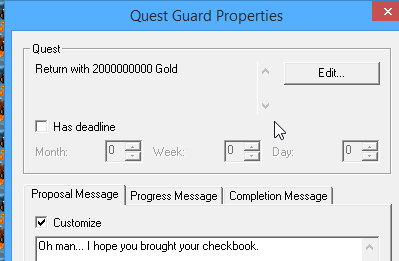 The editor you provided doesnt have the special objects for me...its only the normal WoG editor? I chose the version without installation, do I need another one? I can't remember, I got this a long time ago. I've packaged what I got from there at this link. That mapeditor is very useful! Edited by Biobob at 22:50, 07 Jun 2016. 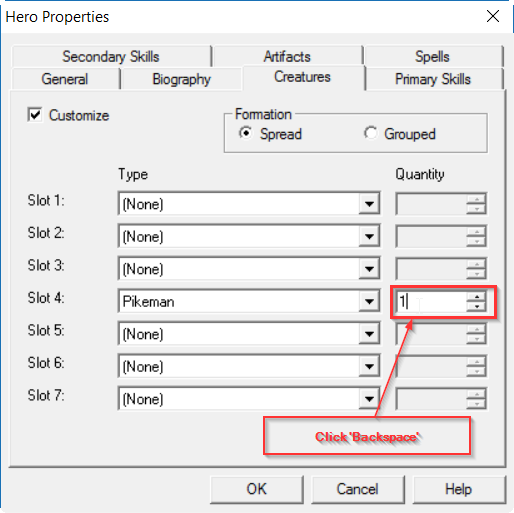 It can be a quite annoying problem for mapmakers who want to diminish randomness to have at least 4 possible skills upon level up. Here is a "cooking recipe" to disable all of them! Well I guess it can be interesting as a background, like 'Fiery Fields' below snow trees a-la-Darklord. To me it breaks immersion a bit too much to be used straight up. Have you ever wanted to create areas with perfectly straight lines without much difficulty? 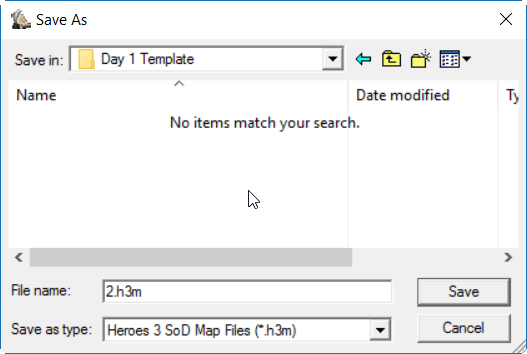 Download this edited maped.exe, extract and place in /Heroes3 folder. All credits to Chinese creativity. 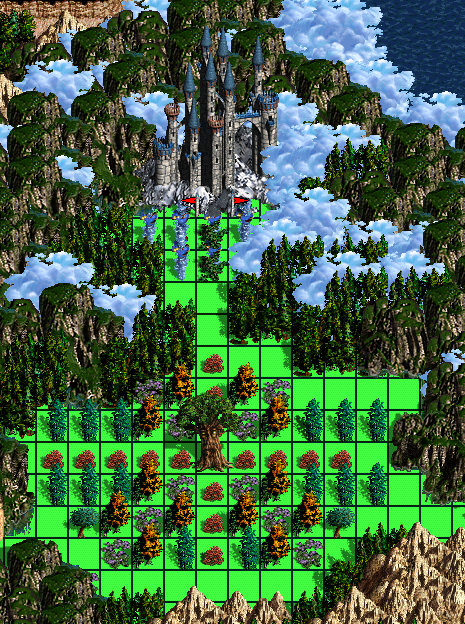 Tiles in the .h3m format are represented by 7 bytes each, with the 1st byte determining terrain from 0-9 and the 2nd byte representing the sprite of that terrain. 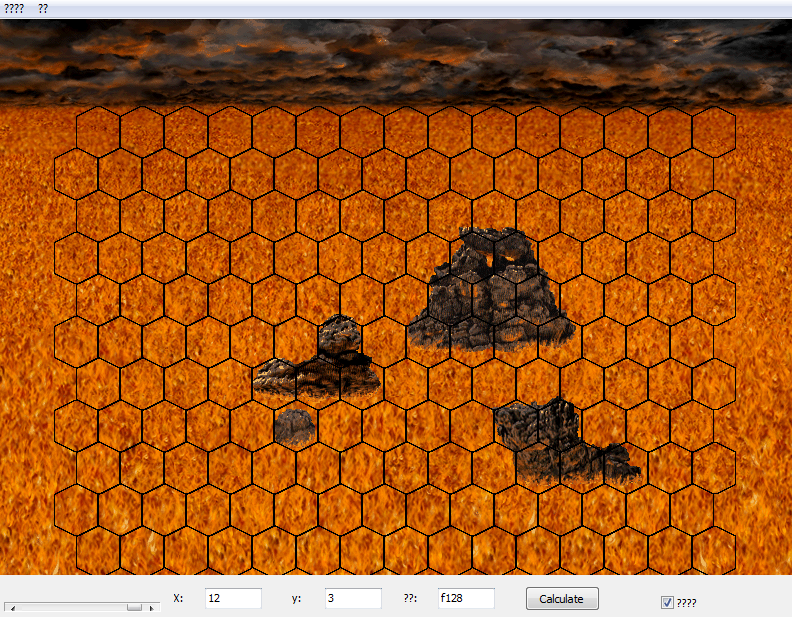 In this screenshot I am using a map editor extension I made that allows selecting terrain tiles to hex edit tiles directly inside the map editor to set their terrain, roads, rivers by inputting the corresponding hex values, which allows making some stuff which is normally not possible. 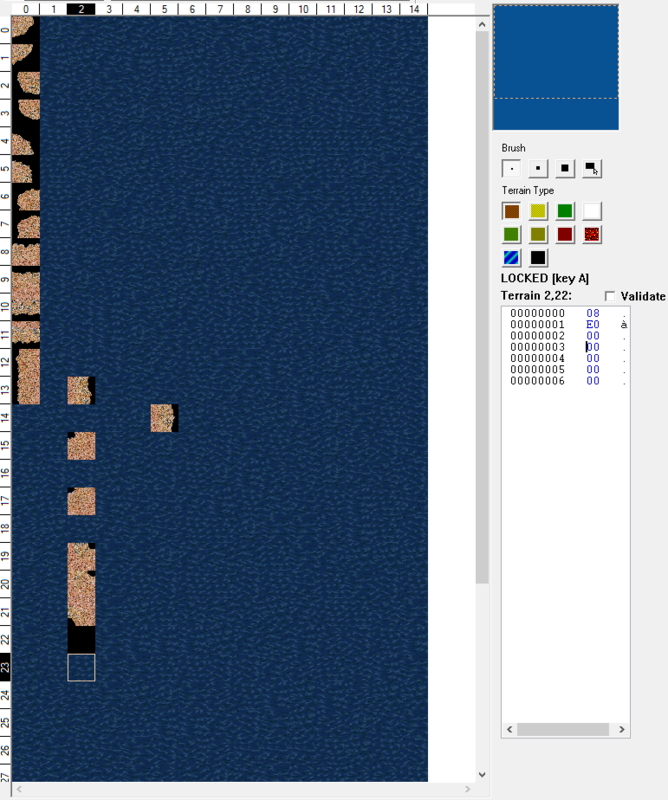 What is shown is what water tiles (terrain 8) are displayed as when their sprite byte is set to high values just below 0xFF which are normally never used. 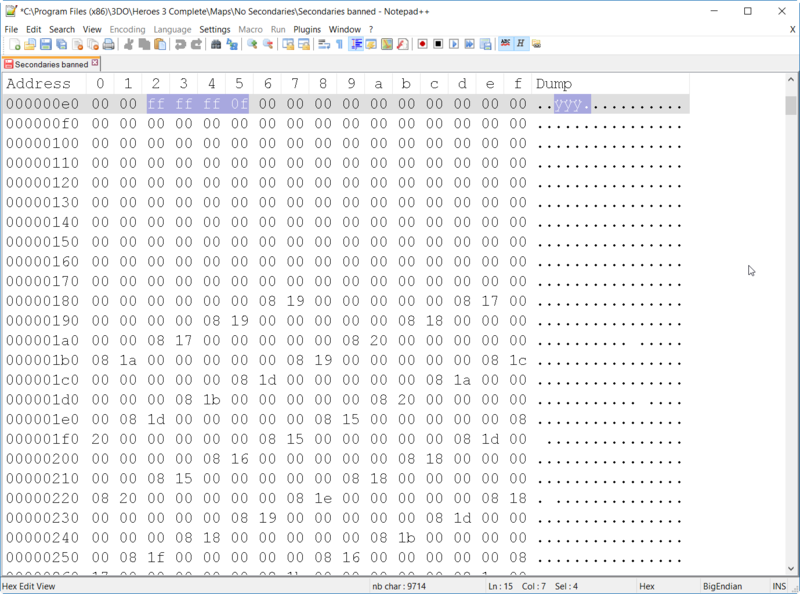 Even without the hex editor extension the map will show up like this when loaded in unmodified SoD map editor without mods of any kind. Minor correction: this step is not needed and makes no sense. Edited by Biobob at 15:13, 26 Mar 2016. This program combines multiple useful design options for maps. 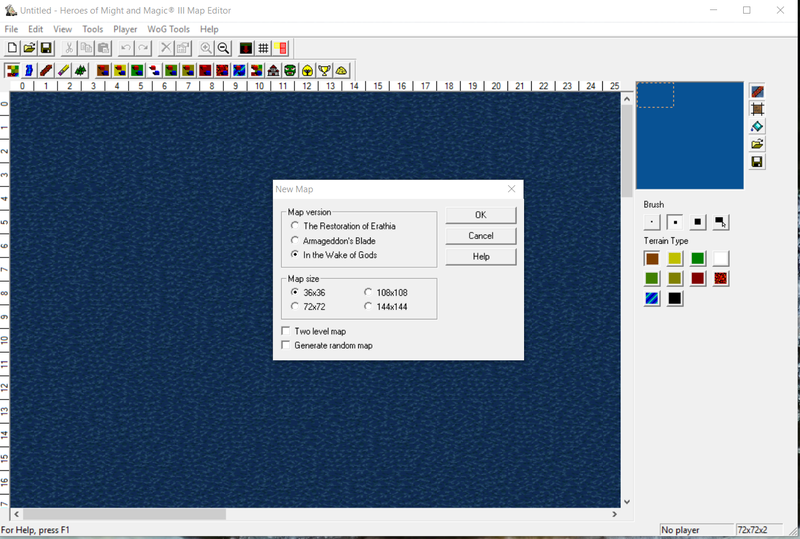 It allows to resize maps, set terrain in any wished for way (although a bit unintuitive to use) and allows to preview combat terrain in an instant. Also you can copy and mirror terrain. It is a useful terraforming tool for specific cases! This is a very simple tool that allows the user to check wheter a specific tile has an upgraded creature, or not. 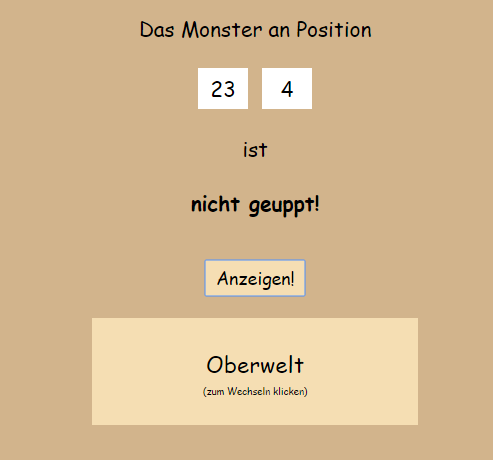 If it says "geuppt", the toops will have an upgraded stack, if it says "nicht geuppt", they dont. Oberwelt means surface, unterwelt means subterranean. This tool is probably known by most. It allows to check for battlefield obstacles in a very convenient way (pressing enter moves the highlighted area to the next box!). @potmdehex Thats a gorgeous find! Can you upload that modified editor of yours? Would be great! The .h3m extension uses a compression algorithm. 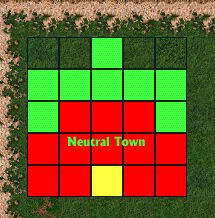 For mere mortals, it's simpler to do hex-editing after unpacking the map because FFFF is 65,535 instead of looking for... I have no idea what to look for! Edited by Biobob at 15:18, 26 Mar 2016. If you are using ERA, then the .exe is 3.2! Edited by potmdehex at 15:55, 26 Mar 2016. 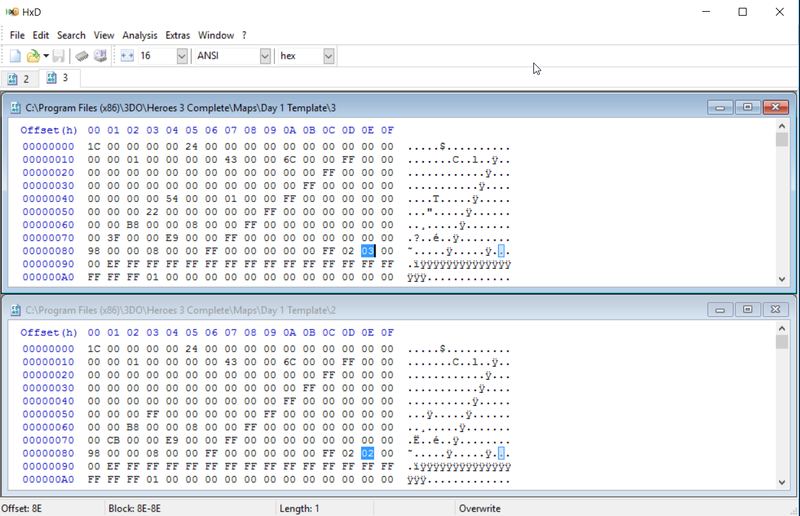 The .h3m vs .7z stuff was mostly nitpicking, but to keep it constructive I recommend anyone who finds themselves often hex editing to make it as easy as possible to extract .h3ms, in any way they prefer. 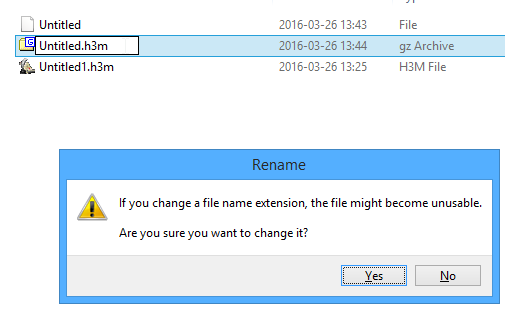 7zip does not care about extensions (which also is why it manages to extract when incorrectly named to .7z), you can use both right click->extract or open them in the 7z file manager while they are still named .h3m. As RoseKavalier pointed out the correct extension would be .gz (don't worry man, we're all mortals who uncompress instead of looking at compressed data, I was just talking about renaming). 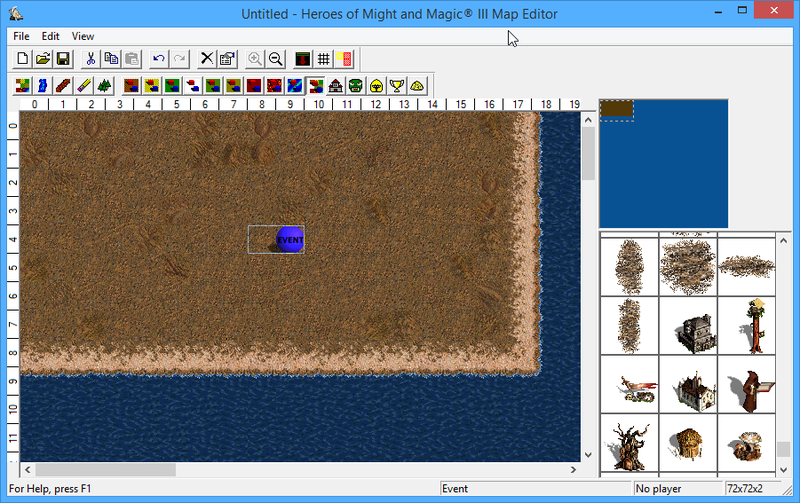 The best in my opinion if you are really hex editing a lot is to use a map editor extension that makes it save uncompressed directly, eliminating the extraction step. I made an extension that worked in conjunction with Hex Workshop that did this amongst other things. 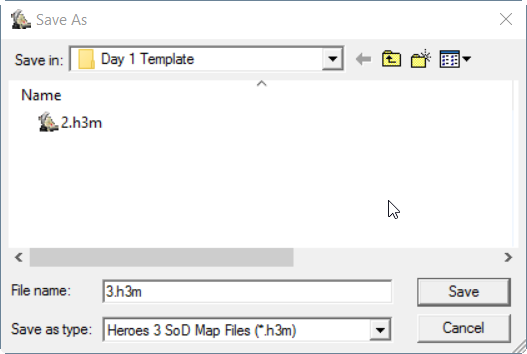 It would update the Hex Workshop view of the file whenever the map was saved, and would reload it in the map editor when F5 was pressed. It also marked the different parts of the .h3m format inside Hex Workshop. 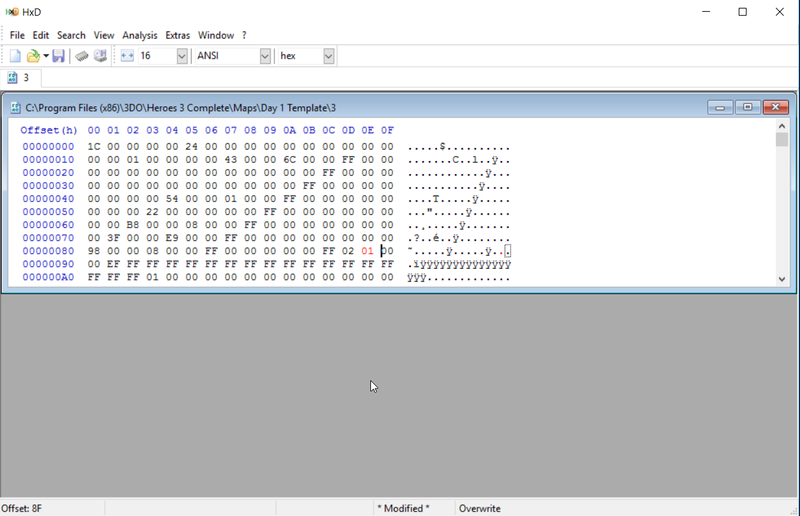 I intend to release the unreleased map editor stuff I have at some point but it's in a messy state and was only ever meant to be used by myself when reverse engineering the .h3m format and developing h3mlib. In addition to my own stuff I am currently involved in several H3 mods/projects behind the scenes so it might take a while. Another thing I have never seen discussed and don't think anyone but me has ever realized is the possibility in unmodified H3 Complete/SoD to create objects that are hidden in the map editor but shown when the map is loaded in-game. 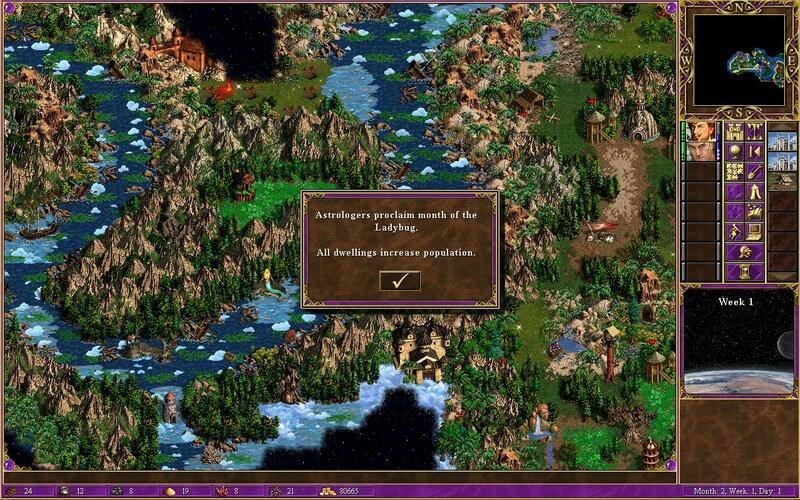 To do so is quite complex and something to be explained in detail at another time, but briefly speaking it can be achieved by manipulating the sprite names in the object attributes section so that the game stops parsing data as belonging to this section and begins interpreting the data as the start of the object details section, whereas the map editor is still treating it as part of the object attributes section and thus not showing any objects placed in this way. To make it clear, arbitrary code execution, which can also be achieved in .h3ms for unmodified SoD and used to do literally anyhing, is not needed for this. 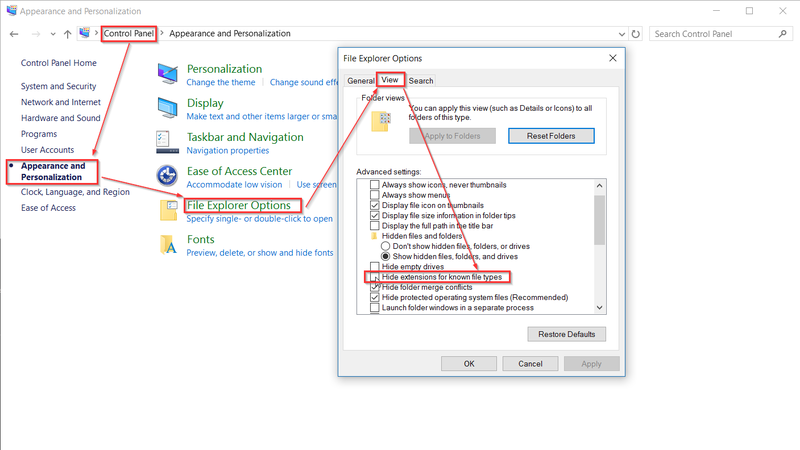 7zip does not care about extensions (which also is why it manages to extract when incorrectly named to .7z), you can use both right click->extract or open them in the 7z file manager while they are still named .h3m. As RoseKavalier pointed out the correct extension would be .gz (don't worry man, we're all mortals who uncompress instead of looking at compressed data, I was just talking about renaming).[...]. Well this is really nifty trick. posted March 26, 2016 07:13 PM bonus applied by angelito on 29 Apr 2016. Edited by RoseKavalier at 19:22, 26 Mar 2016. Credits to Liu Xue Lian for this method. First, we're going to create a map and place something we want to edit beyond the normal limits. 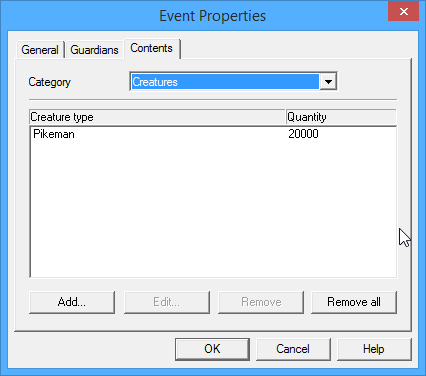 For this example, we're going to break the '9999 creatures' cap on events. Pick the creature you want... 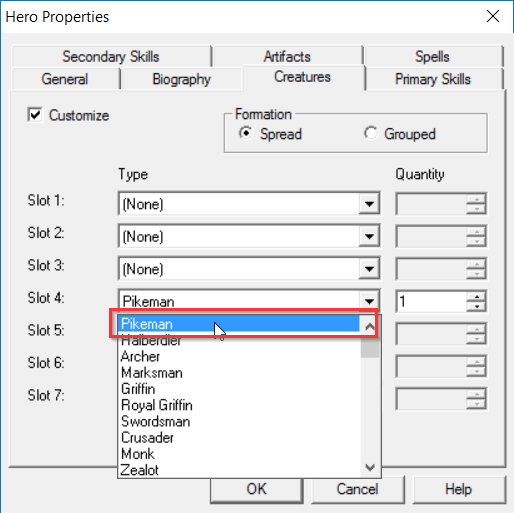 I will use Pikeman for example and set a number that is fairly unique. '1' is a poor choice but something like '9876' is quite unique! Save the map and close it. Next, we need to unpack the map as it is stored in a gz format. 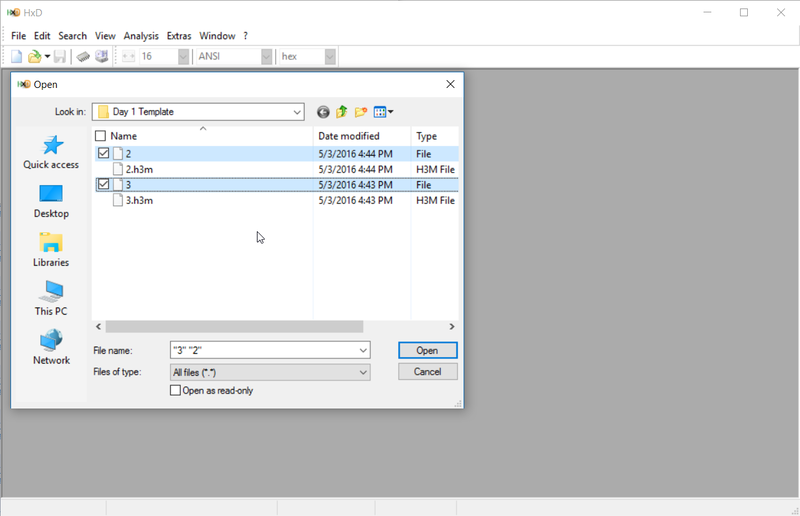 One suitable program is 7zip, easy to find on any search engine. Use the unpacker to 'Extract' the map, this will unpack it from the compressed format. This will create a file with the name of your map but no extension. 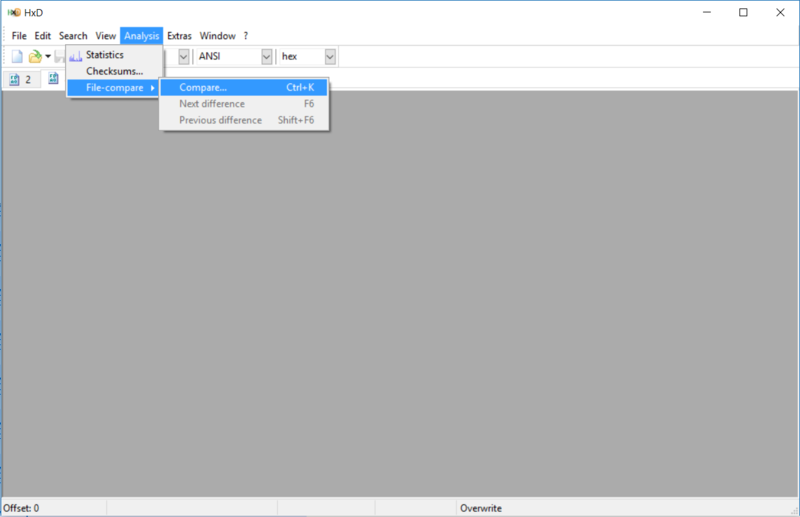 Now we can begin hex editing! In order to do this, you can use any hex-editing software. 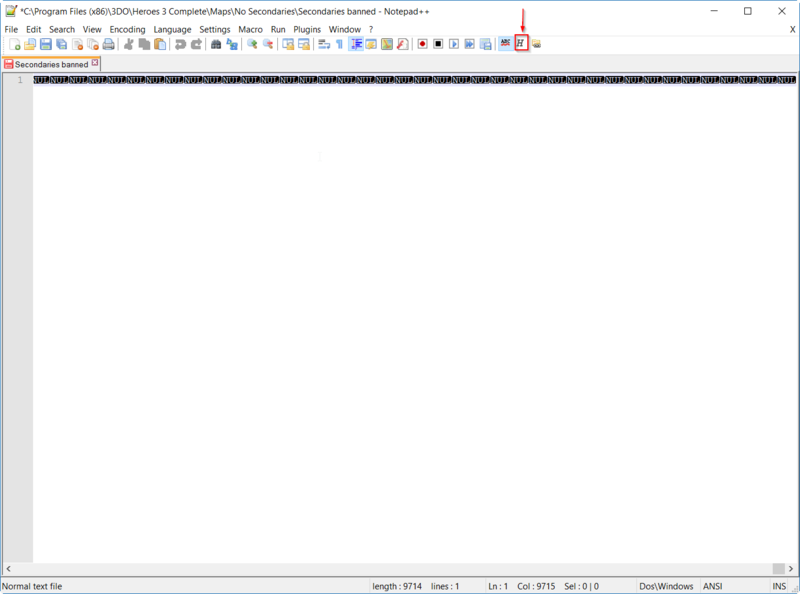 Personally I simply use Notepad++ with the Hex-editor plugin because it's hassle-free. For simplicity, I will show it with Notepad++. If you use this, trigger the plugin with Ctrl+Shft+Alt+H. 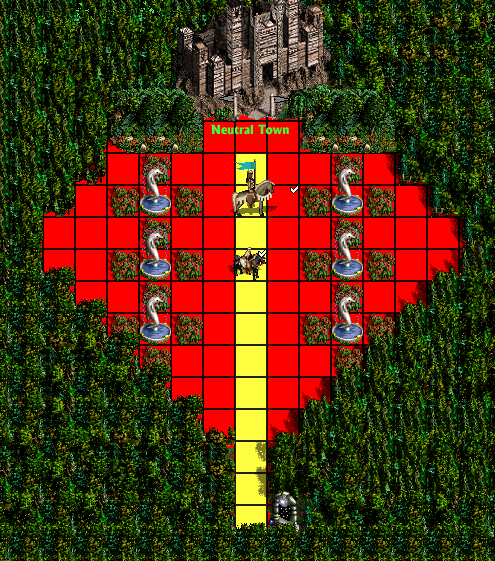 We are now in the hex-editable part of the map. 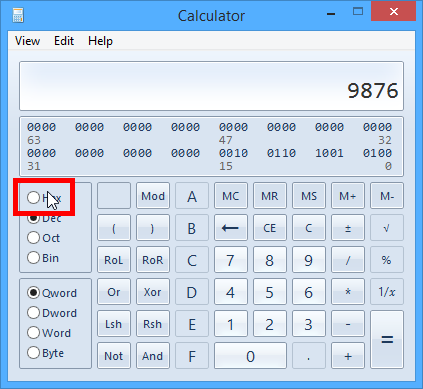 Okay, remember our '9876', open up a hex-capable calculator and write 9876, converting and then convert it to hexadecimal. Now comes the tricky part... the hexadecimals are not stored in order. Each byte (2 digits) is placed in reverse order. Example: the hex number 1234567890 would be stored as 9078563412. Exception!!! If you have an odd number of digits, then add a 0 at the start and reverse it as before. 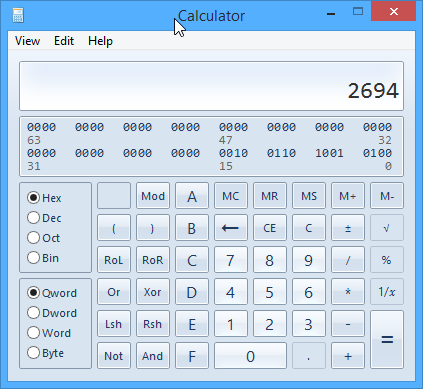 Example: 617's hexadecimal is 269... so make it 0269 and we would look for 6902. Now that we have found it, we have to figure out what we want to change it to! 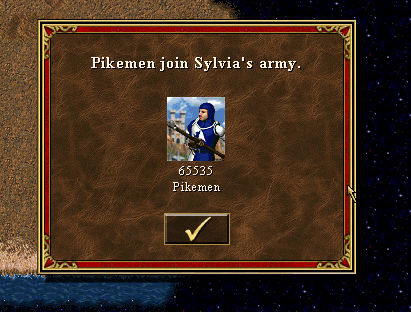 Let's say we want... 20,000 pikeman. 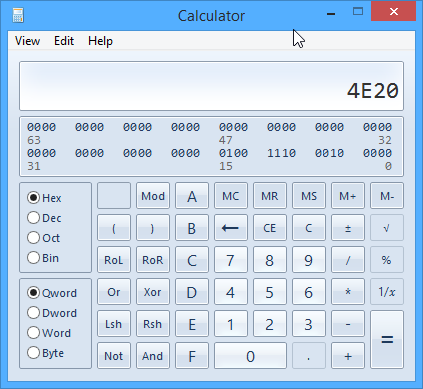 Use the calculator to find the corresponding hexadecimal: 4E20... reverse it to 204E. Now change the text to 204E, save and close. 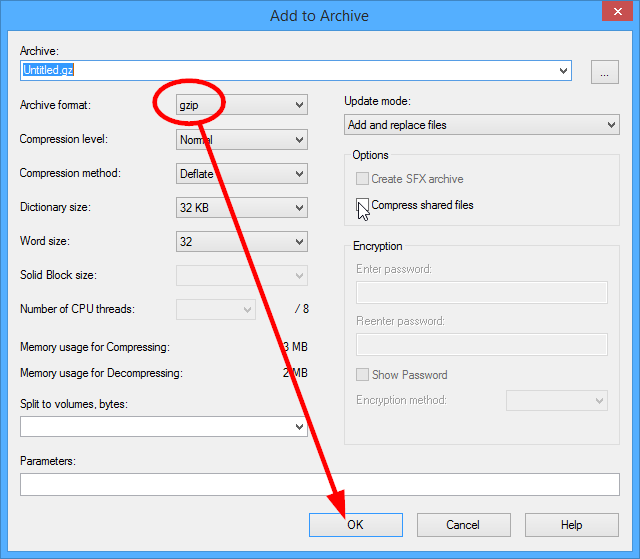 Use 7zip again to compress the file back into a '.gz' extension. Now that is compressed again, change back the extension to '.h3m'. There we go, 20,000 Pikeman event! The possibilities are almost endless, you have to fool around to discover them. 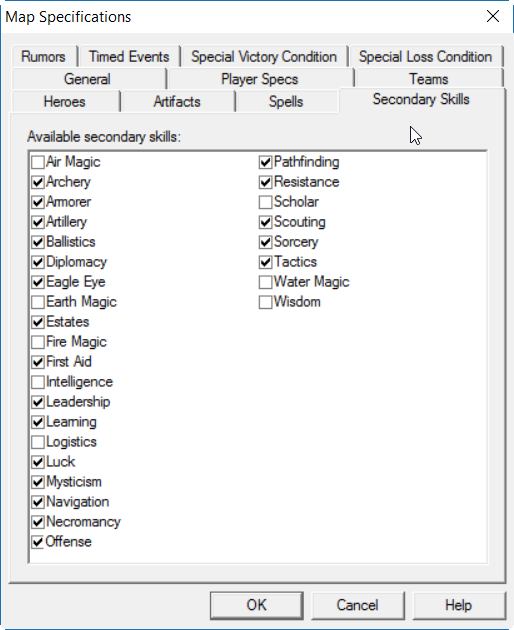 A lot of caps are multiples of 2, such as 2^31 (experience, gold), 2^15 (creatures in events, pandora) or 2^12 (wandering creatures). Uau! Very interesting thread, thanks Biobob and RoseCavalier. Did I understood correctly? 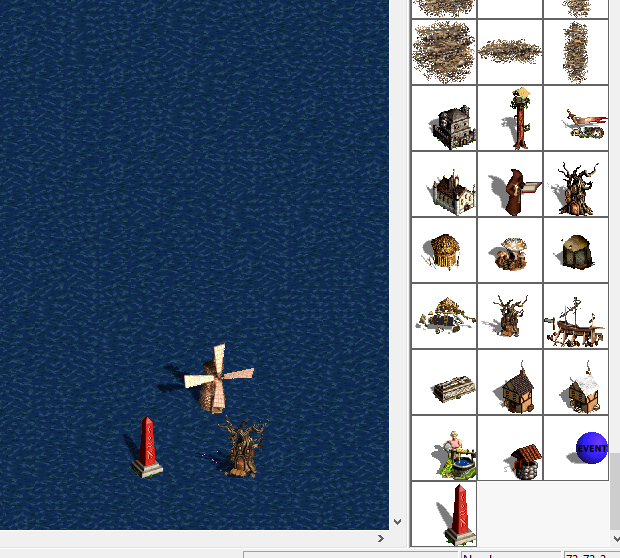 I can add an object (from Freds Object Pack for instance) to the original sprites using just SoD and it will work in game but player will not be able to open it on the maps editor. Is that it? For SoD it's a bit less functional because it's difficult to change stuff. However with HDmod, you can place a .def sprite in /Data/ and give it a name that matches an existing object. 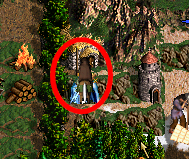 The existing object will no longer be available as a sprite but if you place it in the map and load it in game, you will see the new sprite instead. For example, I've extracted ZSnow001.def from ERA lod (the snowing animation). Then I renamed it icedelt4.def and placed it in /Data/. Now whenever I place the ice delta #4 in a map, it will appear as the snowing animation in game when using SoD. To remove this change, delete the .def in /Data/. This is something I wish I had discovered much earlier. If you read my 'Empire of The World 2' rush, you might remember I had some issues with 'Creature of the Month' as I was playing in SoD. 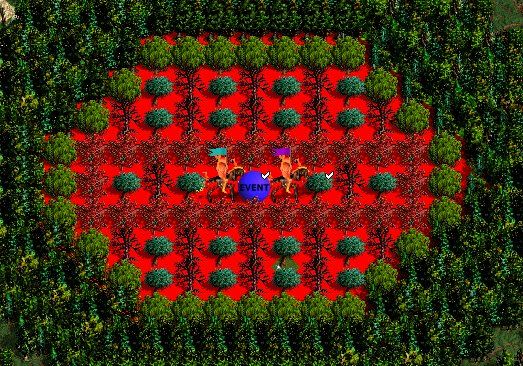 No matter what I did, Centaurs would spawn at the beginning of month 2. This proved quite problematic. With new findings, I am no longer afraid of 'month of the X' in SoD. 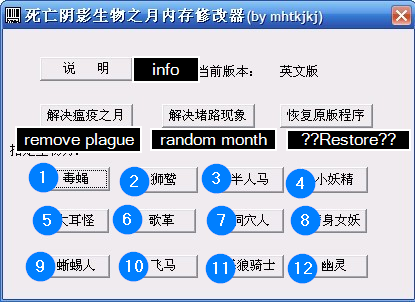 Credits to mhtkjkj from Chinese forum. Run this little program at the day BEFORE the new month. You will need to run it as administrator in newer Windows versions. Never fear again! Here is what it looks like if you have Chinese font (I don't, it just looks like a lot of ???????????). With some pain, I was able to translate the text to figure out what does what - verified with trials obviously. 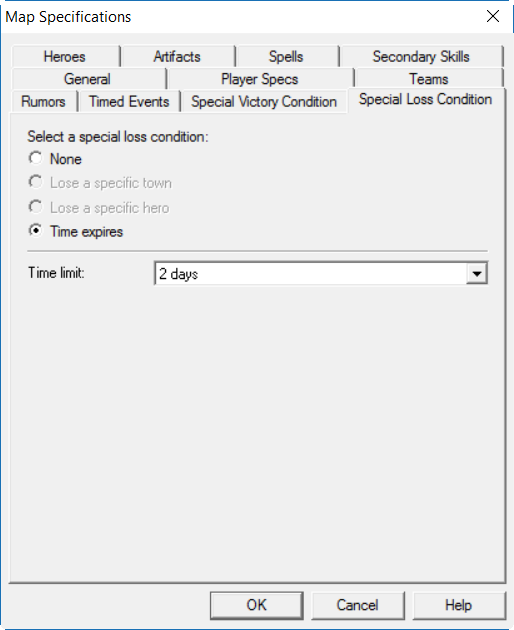 To remove the spawning creatures, click on the "Random month" button and then end your turn in game. You'll get a non-creature month like "month of the Ladybug". 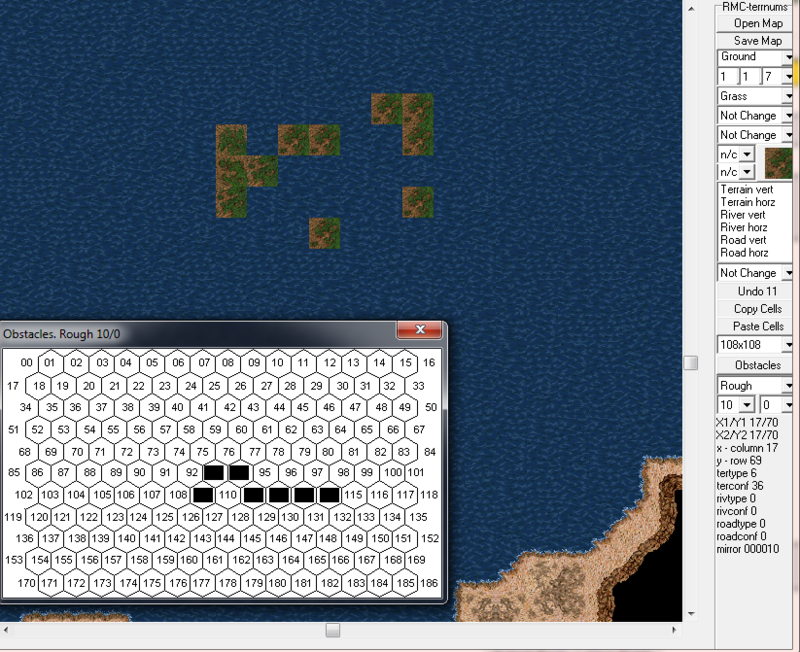 Pressing any of the 12 numbered buttons will make it spawn that type of creatures! Finally, you can also use this to get rid of Plagues in the same fashion. This is really nice for dinosaurs who don't want to move to ERA + Safe SoD to enjoy the wonders of Turbo WoG. Edited by bloodsucker at 16:49, 28 Apr 2016. 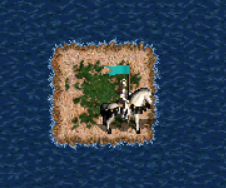 Not only, HotA isn't as flexible as WoG and I bet the sprites trick works. Edited by Biobob at 22:52, 07 Jun 2016. 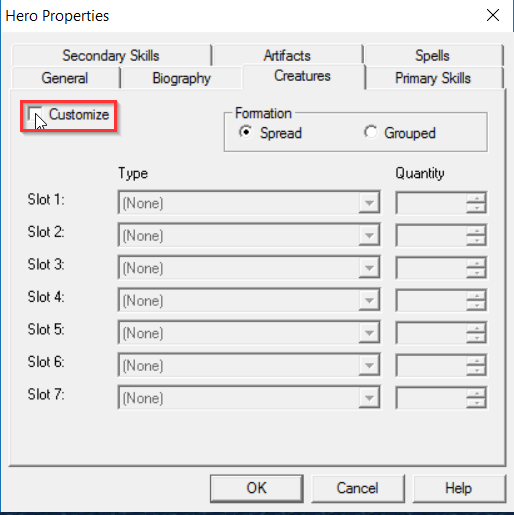 Today we will learn about a different method of hex-editing, best suited for working with small values that are otherwise hard to find by the method described above by RoseKavalier. 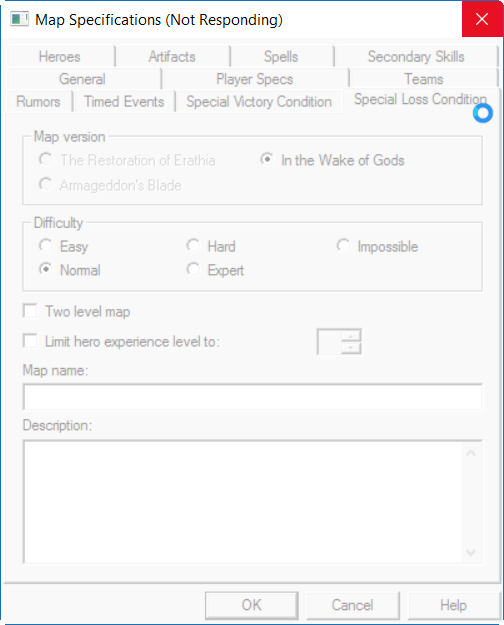 In the shown example, we will change the loss condition of a map to the end of the first day, which is normally not possible in the H3 editor! 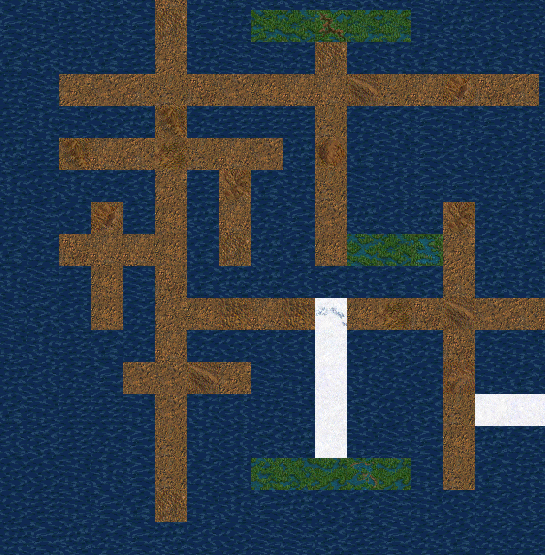 Instead, check it ingame (need to add a hero to the finished map, or it won't be playable). 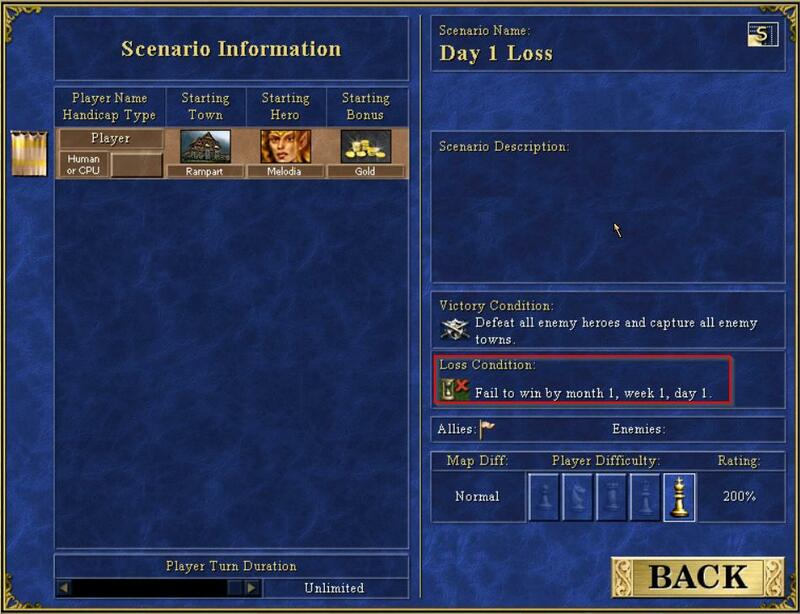 Indeed, the loss condition changed to one day! A glorious thing for day-1 puzzle maps! This method can be applied to all problems where values can not be easily changed or need to stay low, with the most important one being the one described here.